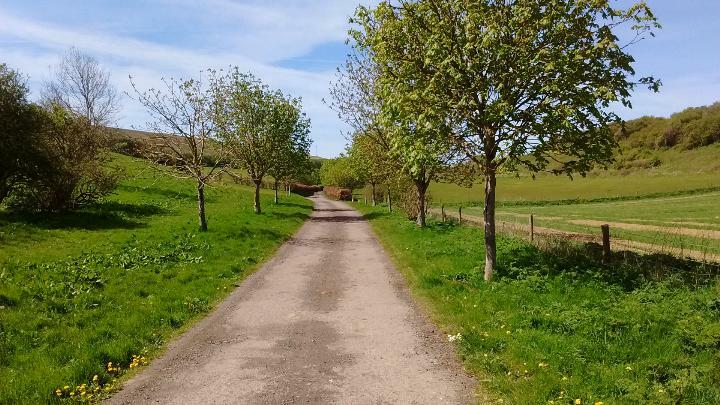 A fine, varied ride with lots of well surfaced off road cycling, including open sections of the Egrets Way, rural Peacehaven and the undercliff ride into Brighton. Plus a great tapas bar. 24km, 15 miles Largely flat or downhill, but steady, fairly gentle climb up to Peacehaven and a final climb to Brighton Station. All of this ride is either on tarmac or on impacted earth with a suitable top covering. But parts in the north of Peacehaven are somewhat pot holed- however the pot holes are easily avoided and there is an alternative route. Suitable for town or touring bikes. Starts at Lewes Station. Finishes at Brighton Station. To avoid the road section from Kingston to Southease you can start from Southease Station or the South Downs YHA at Southease. This gives you are route that is nearly all off road. Trains run frequently between Brighton and Lewes. Note that normal bikes are not allowed on trains into Brighton during the Monday to Friday morning rush hour or out of Brighton in the evening rush hour on the same days. Southease station currently has hourly trains, but there are plans to increase the frequency. All refreshments at Lewes and Brighton, café at the garden centre in Kingston, pub at Rodmell, café at YHA Southease Pub at Telscombe Cliffs, highly recommended Tapas bar on the front at Saltdean. Café on the front at Ovingdean. On and by the station in Lewes, on the front at Saltdean, Rottingdean and Brighton. (1).Turn left out of the main entrance of Lewes station. Quickly turn right at the roundabout. Cycle along this road, past the pub on your right, and then pass Southover Church. Immediately after the church turn left, following a cycleway sign. Ride under the railway bridge and past the tennis club. Then turn right and follow the track under the A27. You are now on the Kingston section of the Egrets Way. At the end of the tunnel turn right past a barrier. Follow the track round to the left. It opens out into a wider tarmacked space. Turn right by the sports pavilion and then left on a shared use path next to the road. At the end of the sports ground the path turns left and then right to run parallel to the road, re-joining it near Springbarn Farm. The cycle track then continues on the other side of the road, but many cyclists prefer to cycle this section in the road in order to avoid crossing the road. Continue straight ahead at the road junction and follow the road to through Rodmell, passing the Abergavenny Arms on your left. After Rodmell descend a hill and then climb again. (2). At the top of the climb is a turning on your left, just before a bus shelter. Follow this through Southease village, keeping straight ahead until you reach the river Ouse. Turn right through a gate on the right just before the bridge. Southease station and the South Downs Youth hostel are straight ahead over the bridge. If you are starting from the station, turn left at the platform exit and follow the road. If you have come from Lewes you will have to cross at the level crossing. Cross the river and then turn left through a gate. You are now on the Egrets Way again. Follow the cycle path to where it joins the road. Go through a gate and then turn left on a further short section of cycle path. At the end of the cycle path cross the road carefully. There is a track ahead of you which divides immediately. Take the left hand fork, heading for some impressively large gates. There is a gap about 4 feet wide on the left that you can ride through. Despite the gates, this is a bridleway, so available for bikes. Follow this tarmac track gently uphill. Look out for some wide drainage channels that run across the route which need to be negotiated. This fascinating area is part of the Peacehaven plotlands. When Peacehaven was first developed just after the 1914-18 war plots of land were sold off to individuals who could built what they liked. Some of the plots here at the back of the town never sold. In future they may be developed but here there is only the occasional house. For the next kilometre there are quite a few potholes but you can avoid them. If it all gets too much there are a number of turnings on the left that you can take. If you do this turn right when you reach the first main road, to re-join the route at the end of the main road. The main route continues straight ahead until this is no longer possible. Turn left here and follow the track to the main road. Now turn right. Shortly the main road bears left. At this point a track (Telscombe Road) goes off to the left. Take this. Ignore a small alley off to the left, but when you come to a wider road on the left, by a large bungalow-style house with a street lamp outside, the main route turns left and goes straight down towards the coast. Initially the surface leaves something to be desired, but it is regularly used by cars, which compact it. Riders of all terrain bikes who want to avoid the bungalows of Telscombe Cliffs can keep straight on here. 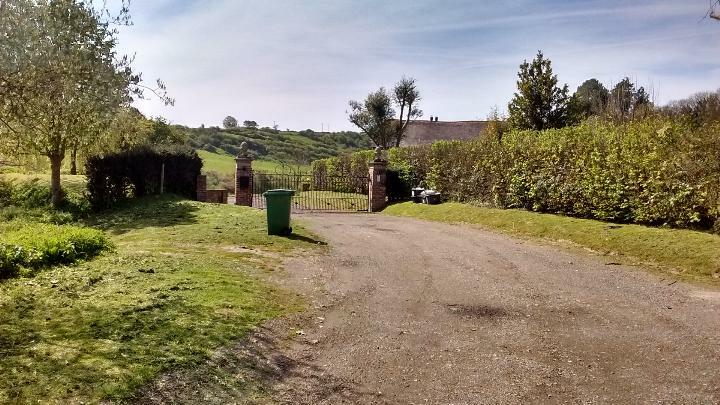 Go through the gate in front of you to reach the open spaces of Telscombe Tye. Keep straight ahead across the grass to reach a track. Turn left along this track to reach the coast road. Cross the road and turn right along the cycle way to reach Saltdean. Pass Telscombe primary school on your left and then take the next turning on the right, Grasmere Avenue. You will see signs for the south coast bike route, which you follow to Saltdean. At the end of Grasmere Avenue turn left into Broomfield Avenue and then right into Springfield Avenue. At the end of this turn left into Highview Road. Follow this to the main coast road. (3).Here follow the cycle route, which has a crossing to take you to the other side of the coast road and then ride on the bike route by the side of the road as far as Saltdean. At Saltdean you can see the open air swimming pool, but before you get to this turn left on a concrete track to reach the promenade. At the bottom turn right. Above you is the White Cliffs Café. Some years ago it was taken over by some young Spaniards escaping Spanish unemployment. A first it sold purely Spanish food, but they have found it necessary to compromise and the menu now includes full English breakfast and Green plate smashing nights. The tapas is still very good though. You now cycle along the promenade to Brighton Marina Please give way to pedestrians. At the far end of the marina do not take the route to the right going uphill, but instead turn left round the far edge of the Asda car park. As you near the multi-story car park turn right through a tunnel to reach Black Rock. Pass the Volks Railway station and turn left along Madeira Drive. About 400 metres along you join a clear cycle route which you follow past the pier. There can be a large number of pedestrians here. (4). Continue straight ahead past the pier until you come to the Odeon on your right. Here turn right up West Street (Use the Pedestrian crossings to cross the main road) Continue up West Street and go straight ahead past the Clock Tower to reach Brighton Station. I have used the shortest route from the sea front to the station. It is quite busy, but avoids complicated navigation. If you know Brighton well you could plot an alternative route from the Pier to the Station, or you could you could use Cycle Streets to plot a route.